I used 2 of my favorite motifs, a plank background and a wreath! I used my wreath builder to make my wreath, using mostly Gina K's autumn wreath elements, but with some other additions, too. That was fussy-cut and then I used a dark brown ink to stamp my planking on blue cardstock. I wasn't sure that a stamped sentiment would show on top of the background, so I used a tag die to finish it with the word "happy". This week our theme is the ever-popular Anything Goes, and the team and I are showcasing one of my favorite stamp companies, Hero Arts! I adore their color layering sets, so I got myself a fall one and made 2 cards. I masked off a rectangle on a cream card panel and repeatedly stamped one of the sentiments, then removed the tape and trimmed it with a Stitched Rectangle die. That panel was framed closely with kraft card stock, then placed onto a plaid panel. My leaves were stamped and fussy-cut before arranging them above the rest of the card. My next card also uses masking, with 2 more of the leaf stamps and another of the sentiments in this set. I stamped my sentiment in the center of my card base, then covered it with purple tape and stamped the leaves along the edges of the tape and upward/downward. I also used the same inks to splatter before removing the masking. Then I popped up 2 of the larger leaves, stamped in multiple colors and fussy-cut. This is a CASE of a card by Narelle Farrugia. I am always looking for masculine designs, and hers is perfect with the woodgrain and branches! I inked the big background stamp in 3 warm distress inks, then spritzed it lightly before stamping it on watercolor paper. Love vertical sentiments like these that describe something, in this case, fall! This one is evidently discontinued, but HERE's a newer one that would work just as nicely. This week our theme is Bling it On! and my teammates and I are playing with Studio Katia goodies. I chose a floral stamp set and some flower sequins from them, coloring the flowers to match the sequins, and made a shaker card. I stamped both strips of flowers from the set and colored them, alternating the bigger ones between yellow and coral, and then did the leaves in green and the smaller flowers in aqua. Then I cut apart the 2 strips so that I could piece a semi-circle around my circular shaker. I also added a few aqua sequins inside my shaker circle to carry that color througout. Just sharing a card I made for our youngest Grand today. Blog Hop: A Charming Christmas Collection and a giveaway! Welcome! I was so pleased to receive some die sets from the Charming Christmas Collection by Becca Feeken and I'm thrilled to be participating in this New Collections Blog Hop! You should have arrived here from Kittie's Blog. supplies: kraft, white, green, and Schoolhouse Red card stock, Charming Cottage Box die set, 1/4" double-sided tape, and adhesive foam to secure trees. This set makes a darling 2 1/2" by 4 5/8" tall cottage. I cut out the windows, thinking that at Christmas I'd put a tea light inside. It would look good nestled into a Christmas tree, or on it's on in a little vignette. Better yet, you could make a whole little village with this set, using different colors or prints of card stock. Next I used the same die to make a gift box. I used a falling snow (dotty) patterned paper, added another of the tags from the set, and embellished the sides with 3 of the 4 Yuletide Snowflake dies, layering the smallest over the 2 middle-sized ones. And finally, here are my 3D Angel Ornaments - they are lovely, so much detail at just under 3" tall! I did my first in a cream cardstock with a gold glitter collar, and then a silver foil one with a silver glitter collar, and a rosegold glitter one with a rosegold foil collar. A closer look. I cut 2 of each die and glued them back-to-back before assembling them. The little collar finishes them off perfectly, and they are easy to assemble. These will be a lovely addition to our tree this year! This collection is well named - they certainly are charming, and have Becca's style all over them! Thank you, team Spellbinders, for including me in the Hop today! Just some details about the hop before you go. Spellbinders will be giving away a $50.00 gift certificate to one blog reader, selected from the comments across all the blogs in this Hop. The giveaway closes on Sunday, Sept. 23 at 11:59 pm EDT. The winner will be announced the following Monday in the blog hop post. The winner is responsible for all shipping, duties, and taxes. Lin Brandyberry - - - that's me! Our theme this week is Pop it Up! and the team is playing with fun Lawn Fawn goodies! It's September, and that means all things fall, so I pulled out a much loved set of stitched leaf dies and made 2 cards. Since the leaf dies have built-in stitch lines as details, I thought it would be fun to pair them with Simon's stitched letters. I paper-pieced the letters onto a stitched circle, adding a stamped sentiment below, then attached a trio of the oak leaves to the top and bottom and popped that circle above a panel of the same fall patterned paper that I used for the letters. I used the same leaves for my next card to make a wreath. This card measures about 8" long by 4" wide, and it will fit into a business envelope. Sharyn does beautiful papercuts, and her products include amazing silhouette dies, usually cut in black. But I just didn't like the way black looked against this background, so I did white instead. If you look closely, I also cut out the parade from white glitter card, and off-set it to show behind the plain white, giving a little extra sparkle, just like fresh snow does......Here's another look where you may be able to see the glitter a bit better. I popped up the layered silhouette from the card for some extra dimension. I do believe this is my first Christmas card for this year! Have you started yours yet? Playing with the Peony Dream dies again, this time in fall colors. We've got fall temps and steady rain here today - a good day to stay inside and cozy! Enjoy your Sunday! Playing once more with my new Peony Dream dies. Since the last card used really bright colors, I toned it way down for this one. Who would have thunk years ago that we'd be making cards with all these dies available to us? Our theme is Stamp It! in honor of this month's STAMPtember celebration at Simon Says Stamp! Please use a stamp to make your entry this week, no digitals allowed, please. My teamies and I are excited to share with you some of the new goodies from this release! As I did on this card earlier this week, I paired my new Plank Background stamp with an older Simon stamp set called Brush Stroke messages, using the longer brush strokes in that set to color the planks of this new background. This time I stamped my planks vertically. Then I decided to stamp this new background both vertically and horizontally, which resulted in this grid look, and this time I colored it in fall colors. I took my time and colored in each of the little squares and rectangles using fall colors, and trimmed the panel. Next I cut lots of the maple leaves, colored one of them with matching distress inks, stacked them, added a twine bow and glued it onto my card. My sentiment is also several layers to make it show up better, as the background is so busy. A Little Trick or Treat?? I was so tickled to get a Spellbinders Large Die of the Month kit and had a ball playing with it! It was easy to construct, too. Wouldn't these be fun to make for some special little people on Halloween? The set includes a die with tabs that you cut 4 of, score along the tab lines, and glue together to make the body of the box, plus 4 different 3" square motifs for each side of the box. I made my box from a bright green card stock, then used purple, orange, black, and white for the sides. But there's no reason that you can't make each side a different color combination, i.e., a different colored background for each side! For my handle I just cut a 1/2" strip of paper and added some striped washi tape to it. A sweet friend gifted me with a set of Altenew Peony Dream dies - here's my first card. This is a BIG flower and a BIG plaid, so when I was looking for a sentiment to go with it, I thought this one added to the effect. The flower is easy to put together. I had the idea to use my striped stamp to make a plaid, and using mini ink cubes and my stamping platform, it was easy to vary the colors of the stripes back and forth between pink and yellow. I like that the stripes have a painted feel, too. I hope that you're enjoying your labor day! It's a scorcher here! I'm excited today to be participating in the first ever STAMPtember Blog Party! This is NOT a hop, just a blog celebration of friends who are excited to show off the new STAMPtember goodies that were released yesterday HERE. Each of us will have a promotional banner to share with our followers - we want you to have fun and see all the different promotions available throughout the party! Everything starts at the Simon Says Stamp Blog. And visit there often, as throughout all of September we will be celebrating with exclusive collaborations, contests, prizes, promotions and lots of surprises!! I was thrilled to receive this big background cling stamp called Plank Background - this planking is a modern take on one of my favorite motifs! I first stamped the plank outline background in a dark blue ink, then I used a long brushstroke stamp to color it, using lots of blue distress inks. That panel was then trimmed to fit my card, and then I cut my birch trees, cardinals, and a pine. (I didn't take out the parts of the pine that are built into it - I wanted a silhouette, instead). Those were glued onto my background, and I added the sticker - I wanted something small as a sentiment, and this fit the bill perfectly! One more photo, because I love how this turned out! Before I go, I have a banner I don't want you to miss - you can use it or any of the others you'll find today whenever you place an order, now until September 4, while supplies last. Have fun! You can find just the start of the exciting new releases HERE, with a look at our brand new Simon exclusive products for STAMPtember. 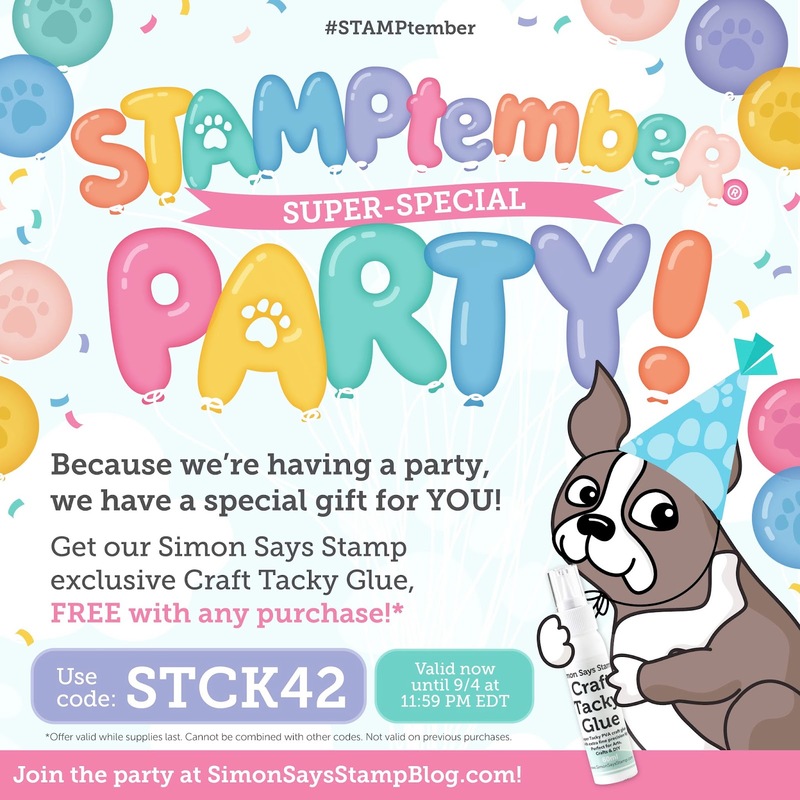 Visit the Simon Says Stamp Blog often this month as we reveal exclusive collaborations, along with contests, prizes and promotions! You can see all new exclusive Simon products now, just click on the banner up above. At noon Eastern, join Heidi for a STAMPtember Facebook LIVE to get a closer look at the new release and a peek at the month ahead. And there will be more FaceBook LIVES every Friday throughout the month! On Sunday, Sept. 2, we're planning a Blog Party with over 100 participants. Each participant will have a little surprise for you. And as the week and the month progress, look for Simon collaborations with some of your favorite companies.